Times Tales is a program (book or DVD) about learning the hardest multiplication facts: the ones with 6s, 7s, 8s, and 9s in them. It also includes the upper 3's and 4's tables. 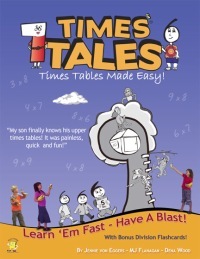 Times Tales is a mnemonic aid, helping the child to remember the tables via simple stories. Have you ever heard of the method of memorizing a list by "placing" or associating each item on a list with a house on some street you know well? Then as you walk thorugh the street in your mind, you remember the list also. Times Tales is based on the same principle. The stories are easy to remember, and through the stories the child will remember the facts. The stories feature four different characters, each corresponding to one of the numbers 6, 7, 8, and 9. For example, the character for nine is "Tree House", and it is drawn in such a way as to resemble the shape of the figure 9. So in the story for 9 × 9, there are two Tree Houses. Or, the character corresponding to number 8 is Mrs. Snowman, so in the story for 8 × 9 (or 9 × 8) there is Mrs. Snowman visiting the Tree House. In each story, the answer number is somehow embedded into the story. 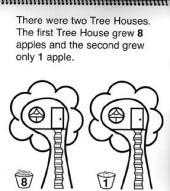 For example, for 9 × 9, there are two tree houses. One of them grew 8 apples, but the other one grew only 1. So the answer is 8 and 1 – eighty-one. The stories are simple, only one sentence long, and come with a picture. You can make the stories to be much fun for the child by amplifying them just a little bit, making up reasons why Mrs. Snowman came to visit the Tree House, or why the other Tree House only grew one apple (which is encouraged in the instructions, as it makes it even easier to remember the stories). After memorizing the stories, the student will practice with flashcards that have the character pictures instead of normal numbers. And after that, you use normal flashcards. This book can be extremely useful for those children that don't seem to memorize number facts. It puts all those numbers into a context that is meaningful. Then the facts aren't just some unrelated numbers without any sense, but through the story they can 'make sense'—in a sense. The website tells of cases where children memorized these hardest facts in less than an hour, and I can verify this being possible by my experiences. I tried Times Tales book with one 12-year old who has had a hard time with remembering facts. In the pretest, he knew 2 of the 16 facts. After working for 1 1/2 hours, he could remmeber all the facts within 3-6 seconds. Another child, 13 years old, knew only 3 of the facts in the pretest. After about 50 minutes he was able to tell them all in 1-6 seconds also. One 9-year old knew 2 facts beforehand, and similarly got to the place of knowing them all within 1-6 seconds after 50 minutes of working. True, these students will probably forget all this if they don't practice some more the following days and weeks. But using Times Tales is taking MUCH less time than the typical methods most teachers and parents are using. Times tales also has pictures and flashcards for division. The stories used are the same, so there is no extra memorizing work. In essence, the child learns both multiplication and division facts with the same effort. Times Tales does not replace teaching your child the concept of multiplication, but it truly works for many children, easily, quickly – and in a fun way. The program is sold as a book or on a DVD. Please see more information at www.TimesTales.com.